NYS Maple Syrup is one of the most popular all natural sweeteners today. Maple syrup is a 100% natural sweetener that is claimed to be more nutritious and healthier than any other sugar. 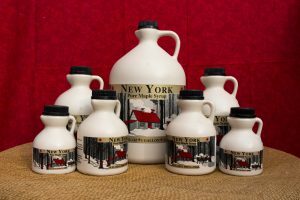 Tapping from the maple trees of NYS, this syrup is the finest. Start the day right! NYS maple syrup is the only maple syrup for your homemade pancakes, waffles and french toast. Try it on a grapefruit, hot cereal, granola, plain yogurt, or coffee. NYS maple syrup can be used for dinner too! Try it on Ribs, Chicken or Pork and sweeten your squash, sweet potatoes and other veggies too. End the day and reward yourself when you pour maple syrup over ice cream,cheesecake or in a milk shake. Tapping from the maple trees of NYS, this syrup is the finest. Maple syrup is a great gift idea. Give a gift that the whole family will enjoy. Whether for Birthday, Anniversary, Wedding, or the Holidays its a gift sure to appreciate. When making your own gift basket, do not forget the NYS Maple Syrup! Check out our line of New Hope Mills pancake mixes to complete the best breakfast in town. Yum! Yum! Kids of all ages will love this breakfast any day of the year!